Casino Royale, a French fanfilm ? 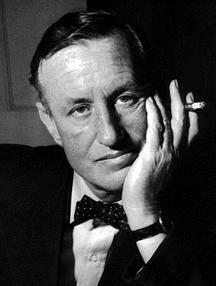 In 1953, Ian Fleming created James Bond. The least secret spy in the world has become a legend which has changed the entertainment industry forever. In 2003, for the fiftieth anniversary of the creation of Ian Fleming’s hero, it was time to pay tribute to this literary and cinema myth . 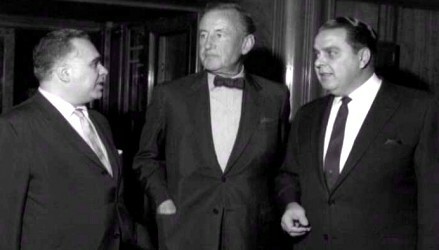 In September 2004, Eric Saussine, founder of Constellation Studios, called his friend Pierre Rodiac, former president a French James Bond fan club . Eric wished to adapt Casino Royale, the only Ian Fleming James Bond novel that was not seriously adaptated by Eon, holder of the movie rights. Excited by the project, Pierre Rodiac started writing a synopsis and the two men worked alternatively on it. It gave way to a script which Eric wrote and Pierre corrected that was a faithful adaptation of the novel, with all the trademarks of the movie franchise. The search for actors and locations started immediately. On February 3, 2005, Eon Productions announced that Martin Campbell would direct the 21st film of the series. The title was... Casino Royale ! Eric Saussine reacted to the great news and decided to preserve the general plot, change the names of the villains, the bad guy’s plan, a few scenes and re-introduced a well known terrorist organization and its chief from the Bond films and novels : S.P.E.C.T.R.E. and Ernst Stavro Blofeld. A new script was written in a couple of months and Eric found its title : Shamelady. Pre-production on this short film started in 2004. Filming started in 2005 and went on in 2006. 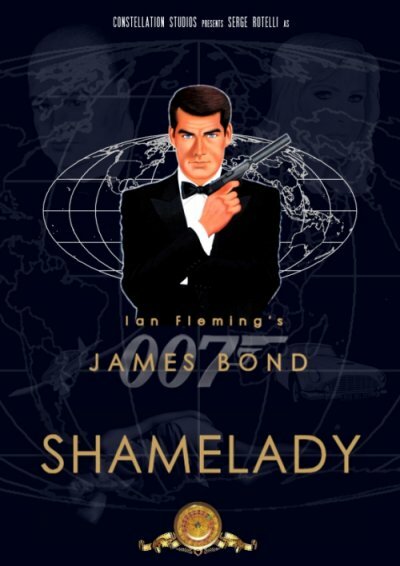 Shamelady is a tribute to the men at the origin of the myth : original author Ian Fleming and James Bond producers Harry Saltzman and Albert Broccoli. James Bond is sent to the south of France to buy information about a secret organization that terrorizes Great Britain. During the operation, a couple of killers put a deadly stop to the exchange. Bond escapes, whereas Mangin - who provided the information - is killed. A vivid proof that S.P.E.C.T.R.E. - the criminal organization to which James Bond was formerly opposed - is back. Bond, helped by Joan Jansen - an MI6 operative based in France - goes to the casino of Luc-sur-Mer, Normandy, in search of Descarpes who is suspected of being the number 2 of the organization. Bond challenges Descarpes at the roulette table and seduces Anna Raykova, a mysterious Russian woman working for his adversary. The spy escapes several murder attempts, and soon realizes that he is being betrayed. In the meantime, Joan is kidnapped by the enemy. Bond goes after the kidnappers, but he is also made prisoner. The interview with producers Pierre Rodiac and Eric Saussine by Justin Milliner from mi6.co.uk is available here. English-language reviews for Shamelady are available here.